You may have noticed I didn’t update the site Saturday. My original plan was to finally put up a review of War for Cybertron. By that point I think I would be able to offer a pretty fair review of the game even though I still haven’t finished both campaigns in the game yet. But I got distracted by Botcon, the yearly Transformer convention. This year it was in Orlando, so I figured I wouldn’t miss out on the opportunity and skipped out on both my work and my blog. 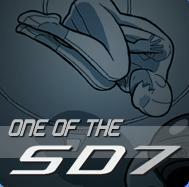 So today will be a double shot; a game review and a con review. Which one was more fun? Check out the reviews after the jump. My first post on this blog was about beer and then, well I got busy talking about robots and cowboys. But now we’re back to beer and I won’t neglect it as much as we move forward. Wednesday is my normal night out at the local pub, so for a little while Thursdays will be the day to talk about beer. In fact we are going to talk about 126 beers. If that sounds like a pretty specific number that is the number of different beers I need to drink to get my own glass at the bar I go to. Some will be pretty well know, I won’t spend much time on them. 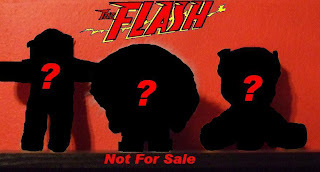 The ones that are more obscure will get a bigger write up. Beer 1 was a Guinness, because that is what I’m normally drinking when I hit the pub anyway. 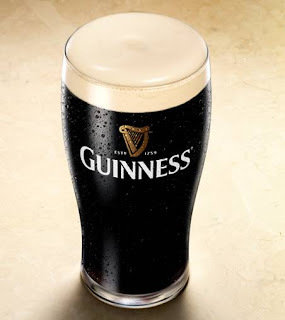 It is going to be hard to get through that many other beers when the Bartenders usually start pouring a Guinness for me as soon as they see me walkthrough the door. Beer 2 wasn’t very exciting either, it was a Newcastle. 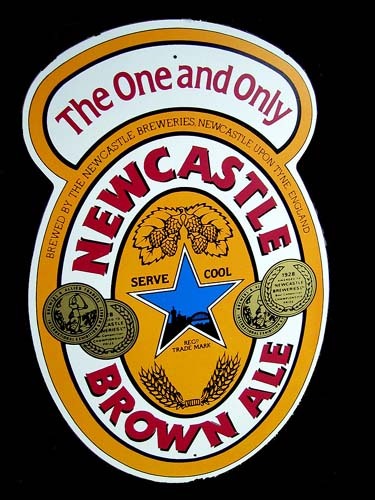 Not that there is anything wrong with Newcastle. I enjoy a brown ale every once in a while. But last night I was just more interested in checking off the beers they have on draft. So it was a Newcastle night. 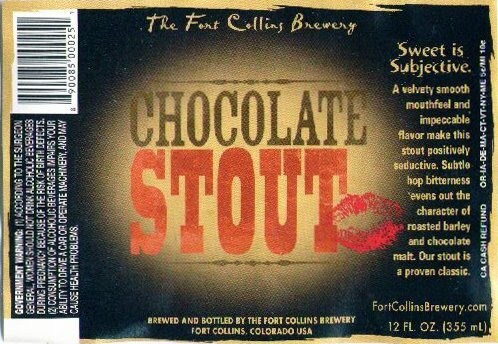 Beer 3 was a Fort Collins Chocolate Stout. Here is where we get interesting. I’ve had chocolate stouts before but not this one. It has a nice head and a good chocolaty smell. You don’t get much chocolate in the taste and the flavor here isn’t very heavy. I am a fan of stouts and this seems not as strong as a lot of the others. So if not being able to see through your beer intimidates you, this might be a good one to try. For those who care about the numbers, ABV was just under 5 and IBU just over 30. Next week we’ll probably get to 3 or 4 other beers. I’ll try to delve deeper into the selection, if anyone has any suggestions on beers to try I’ll see if they have it. So with that I’ll leave you with some words of wisdom from either Dean Martin or Frank Sinatra, they’ve both said it, not sure who said first. I have a longstanding saying that goes, “Dreams and RPG characters are only interesting to the people that had them.” Maybe you can get away with it if the description is extremely brief. Someone says, “Last night I had a dream I was surfing on a Japanese speaking shark,” I’m amused. But I don’t want to hear another 15 minutes worth of said dream. The same goes for role playing games. “I played a vampire street racer once in a LA based game,” is acceptable. Cornering me in the RPG section of a Barnes and Nobles and telling me your character’s life story for an hour is not. With this rule firmly in place, reading about someone else’s campaign should be the equivalent to water boarding. When it comes to Clockworks though, it is the complete opposite. 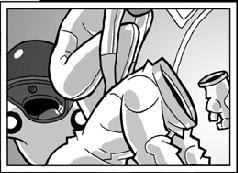 Clockworks is a web comic by Shawn Gaston which retells the events of the game he ran for his friends. It is also a home brew setting using the Savage Worlds RPG system. The reason I’m letting you know about all of this now is that Clockworks just turned a year old! 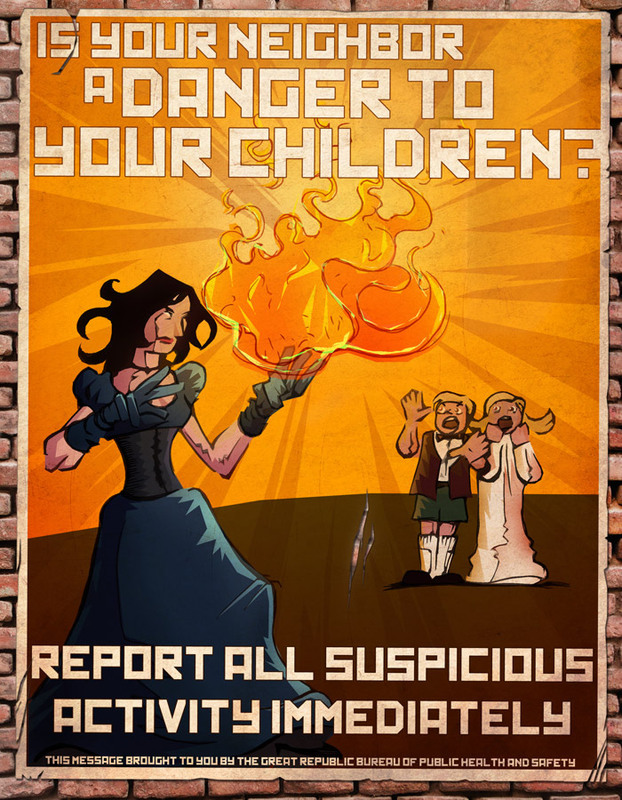 If you’re a gamer, his site has all the info you need to run your own game in the Clockwork universe. If you don’t care about spending nights with funny looking dice and character sheets you can still enjoy the strip without feeling in the dark. Like any web comic the art is always evolving, but you don’t really notice until you go back and look at the older stuff. I’d say Shawn’s layouts and flow have really come a long way. Hopefully that doesn’t come off as a backhanded compliment. The cast is wonderful. Eva, Thornton, Toby, Ophelia, and Oliver are very fun characters that we are getting to learn about as the comic goes on. Except Oliver, damn him for being all mysterious and cool...or a vampire. Even more impressive then the characters are the setting. The extra information put out about the game world is deep. Shawn has done an awesome job in creating a world and one of these days I’m going to get a group together and run a game in it. So the Jonah Hex movie came out Friday and made an underwhelming 5.38 Million. Rotten Tomatoes has it listed at 14%. Not a very good percentage. I had made a promise to myself to give the movie a chance; to go into the theater and not expect to see a direct translation of one of my favorite characters. I had two surprises Monday morning when I walked into the theater at 11:45. First, there were actually other people there. Not a lot sure, but I was expecting an empty theater. The second surprise; despite all its flaws, I enjoyed the movie. I’m not saying it is a masterpiece. Maybe my expectations were so low it would be hard to make a movie as bad as I was expecting. But as I watched there were moments in the film that had me grinning widely; even cheering. There were things that made me roll my eyes too. A few times I even received a sympathetic pat on the arm from my wife. Bottom line though, I left the theater and enjoyed most of what I had just seen. Transformers: War for Cybertron is out this Tuesday, unless you go to Sears apparently. There are lots of reports of them breaking street date. I didn’t even know Sears still sold video games. Anyway, to celebrate what looks like it is going to be an awesome game I’ve been counting down my favorite Transformer toys I had as a kid. The list started with Thundercracker, then went to Sideswipe, Tracks, and Slag. Finally we are down to number one. Released in 1986 along with the Transformers Movie, my all time favorite Transformer is Springer. I was 10 when the movie came out, exactly 10 because it came out on my birthday. The movie did many things that probably explain why I’m so strange, but that is better left to another discussion. The important thing it did that we’re talking about today is that it introduced Springer. All of sudden the Transformers were shoved into the far future of 1995. Of course the movie introduced a bunch of new Autobots who never took the form of Earth vehicles; they were all futuristic looking Cybertronian vehicles. 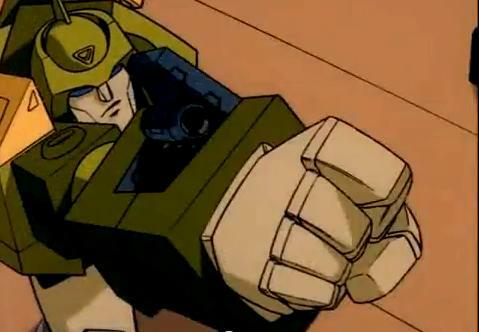 And in my mind Springer was the coolest. More triple changing after the jump. 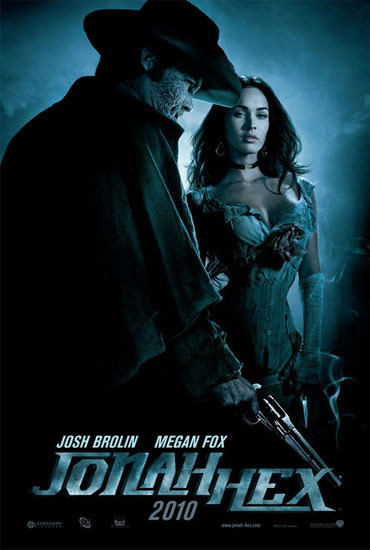 The Jonah Hex movie opens today, well I suppose some places did midnight releases so technically it opened this morning. In case the movie gets you interested in the books the character came from I’ve been going over some easy jumping on points. Yesterday I talked about the earliest Jonah Hex stories collected in the Showcase format. Today I’m going to cover two more current stories. Face Full of Violence and the just released No Way Back. Face Full of Violence, besides having an awesome name is the first trade paperback collecting the new Jonah Hex series. Written by Justin Grey and Jimmy Palmiotti the comics are usually self-contained one and done stories. The fantastic part is at almost any time you could grab one issue and read it without feeling lost in a sea of continuity. They also have no permanent artist, so the style is constantly changing. Phil Noto has been one of my favorites, but the series artist list is full of big names. More Violence after the jump. The Jonah Hex movie comes out this Friday and commercials are all over the TV. Earlier I talked about the different cartoon versions of Hex that are out there. I plan on seeing the movie Monday afternoon, so expect a review Monday or Tuesday. I’ve been a Hex fan for years, but I realize that there may be some people seeing that scarred visage for the first time. If they like what they see they may want to jump into the print version of the character. So over the next couple days I’m going to cover some great books that are fairly easy to pick up. The first book that we’ll look at is Showcase Presents: Johan Hex, Vol. 1. The Showcase Presents books are fantastic deals. They may be in black and white, but the Hex book is 528 pages long. That is a whole lot of Hex for 17 bucks. In this book you get the earliest Jonah Hex stories, well before he even got his own series. 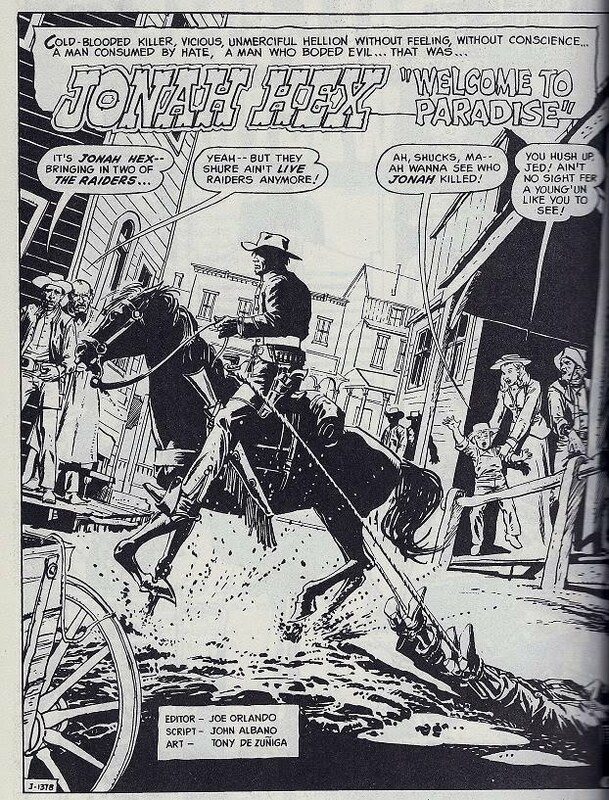 The stories come from Weird Western Tales, although the first is listed as All-Star Western that book changed its name to Weird Western Tales with issue 12. More leather slapping after the break. War for Cybertron is only days away from release so we are getting close to the end of my Transformers countdown. Looking back at my favorite Transformers as a kid we’ve already covered Thundercracker, Sideswipe, and Tracks. The toy line already had cars, trucks, jets, and guns; what else could a kid want? Oh yeah, dinosaurs! The Dinobots were huge when they came out. They looked fantastic. They were all done in the same color scheme, mostly a grey with metallic silver and gold, so they looked like a cohesive unit. 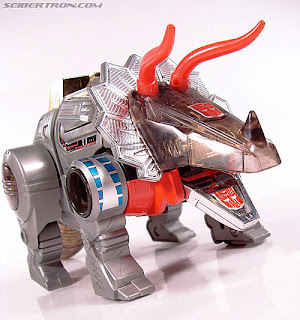 My personal favorite was Dinobot Slag. Slag transformed into a Triceratops which has always been my favorite dinosaur, so as soon as I saw him I knew I had to have him. Except when the Dinobots came out they were incredibly popular. You couldn’t find them on the shelves. Then one day after calling ahead to stores my cousin and I found out that Service Merchandise was getting a shipment in! We waited with my Aunt in the back of the store where there was this long conveyer belt. The Dinobots were in the back and they were going to send two of them down the belt. I was so excited to see those boxes, it seemed like forever. Then finally, we get the boxes in our hands and I could see I got...Sludge, the Brontosaurus. Sure he was cool, but I was so disappointed. Luckily a month or two later I finally got Slag. More Slagging after the jump. A love of monkeys is one of those stereotypical geek things. It is just a given that nerds like monkey references. Where does it start from? While I can’t answer for the collective geek conscious I can firmly say where it started for me. I grew up in Warren, Michigan and when I was very young the Detroit Zoo had a chimpanzee show. 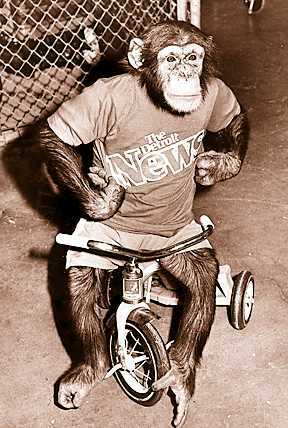 I remember a chimp; I think he was named Jo-Jo. He rode tricycles, he played cowboy, and he was the star of the show. I was hooked. Obviously, something like that wouldn’t fly in the zoos of today. This was before the days of making sure every animal enclosure looks like their natural environment. The shows ran from 1932-1982. Wanting to talk about the old chimpanzee shows got me doing some research about the Detroit Zoo and I found some interesting things to share. So promise to come back to those primates, but first let me get to some other odd stories I’ve found in my research. More monkeyshines after the jump. 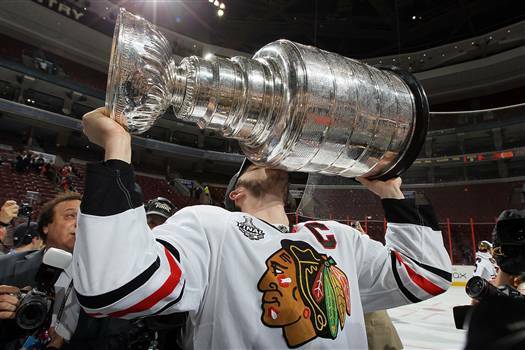 Congrats to the Blackhawks for their first cup win since 1961. The entire series was always close and as someone with no emotional investment in either team; it was fantastic to watch. Antti Niemi was stunning when he had to be. On the Philly side, Scott Hartnell is one of my favorite players to watch. Pronger and Byfuglien were brutal. I kept hoping the Fliers would unleash the Carcillo, but when he was on the ice his reputation was drawing penalties even when he wasn’t. And then there is Marian Hossa. There are a handful of hockey players I don’t like. I won’t go into them all now, but things like refusing to play in a city, comments about your own team, and sometimes sucker punching puts you on my hated player list. Hossa was on my list. Sure it doesn’t mean anything to him, but I’ve come to terms with it and may have given up hating him. More changing of heart after the break. 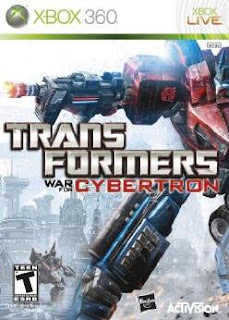 War for Cybertron comes out on June 22. Because I’m so excited about a game that is calling itself a G1 prequel, I’m counting down my top five favorite Transformer toys from my childhood. Number 5 was Thundercracker the only Decepticon to make the list, so if you were hoping to see Megatron you’ll be disappointed. 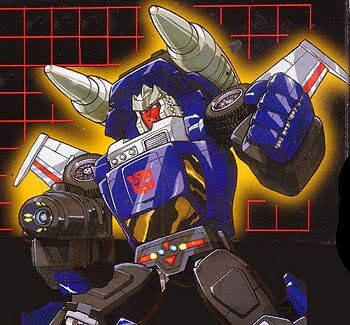 Although as a kid I did get in trouble at an airport because of Megatron, but that is a story for another time. 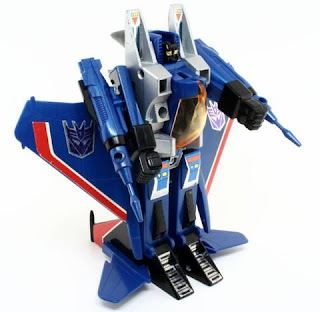 I mentioned how Thundercracker was my first full sized bot; Sideswipe was my first Autobot. Sideswipe transforms into a red Lamborghini Countach. When he switches to robot mode not only did he get a gun, but he also had a shoulder mounted missile launcher. The missile launcher I had didn't fire at all, the spring must have been messed up. In the cartoon, I don’t remember him getting much of a spotlight. Unlike the last Transformers cartoon the starting Autobots had a pretty large cast, so lots of characters were extra soldiers filling in the background. 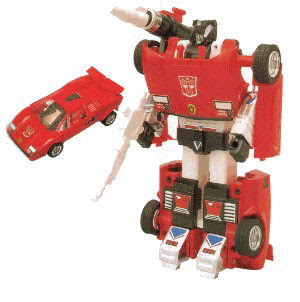 So Sideswipe and his brother were pretty much filler. Wait. What? Did I just say brother? My niece is staying with us for a few days. So my wife and I decided to take her to Disney World; or as my wife would correct me, the Magic Kingdom. See, my wife is a Disney fanatic. To her it brings back thoughts of yearly trips down from Chicago with her family. I’ve lived in the Orlando are most of my life, so when I think of Disney I usually think of long lines, screaming kids, arguing parents, and well you get the idea. While there we saw the construction walls up for the new Fantasy Land upgrade. Apparently there will be separate areas for all the princesses. Fantasy Land is an overcrowded cluster the way things are now, so I see this as a good thing. My wife, who still yearns for the return of 20,000 Leagues and Mr. Toad, isn’t sold on the idea yet. Her reaction got me thinking of the one thing I truly miss at Disney. The one attraction that made me grin from ear to ear, the ExtraTERRORestrial Alien Encounter. More TERROR after the break..
War for Cybertron comes out at the end of the month. The game looks incredible and I figured I’d use my excitement for the upcoming game to talk about some of the transformers I love. I’m going to do a top 5 countdown of the ones who really stick out from my childhood. So sorry Lockdown, you’ll have to wait until I do a more current Transformers list. My first ever transformers was the Lazerbeak and Frenzy two pack. But my first ever full sized was Thundercracker. It was 1984 so I was 7 or 8 at the time. My cousin Jeff got the black jet, Skywarp and I picked the blue one. Robots that turned into jets, they blew my tiny mind. I still remember running around my aunt’s living room try to shoot the missiles into this fancy looking ashtray that was on her table. I think one of the things that gives geeks a bad name is that nerd rage when one of the properties that we love is brought into another medium. We hold so tightly onto continuity that any changes send comic fans running to forums and screaming how the film adaption raped their childhood. We need to learn to loosen up a little bit. No movie is so bad that it ruins the memory of something you love. It doesn’t go into your room and burn all your old comics so that you can’t read them anymore. Jonah Hex is coming out later this month and I’ll be there opening weekend. Am I expecting my vision of Jonah Hex? No, the horse mounted Gatling guns and crossbow thingie have proved to me this is a different interpretation then I’m used to. But I’m going to try to be open-minded and see if I can enjoy something from this version.